Malin’s multi-purpose, high-quality tripwire has countless uses. Military tripwire is a great tool to have at the house, on the ATV, or at your campsite. Because of unparalleled quality, Malin’s wiring is used by sportsmen and handymen all around the world. This stainless steel safety wiring is sure to meet all your wiring needs. Think about duct tape. Duct tape is versatile, flexible, one might even say: the solution to everything. Malin trap wire is the duct tape of all wire. As a result, it is the tool you want in every kit. Whether it’s at the house, the boat, the ATV or the car, it is a reliable, solve-all solution. Because of its endless uses and application, Malin trip wire is sold in bulk. This dependable product can be purchased by the box which includes a 100-count of coils. Established in 1884, Malin has worked diligently to earn a reputation as the leading stainless steel wire producer. Ever since then, Malin has been serving a diverse range of industries. Top products include military trip wire, safety wire, fishing wire, and more. Most importantly, get wiring the way you want it with Malin’s diverse packaging. 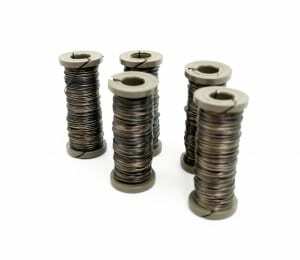 From straightened and cut wire to canisters, spools, and bulk options, Malin has you covered.